In this example the SharePoint Document Library is Accounts. 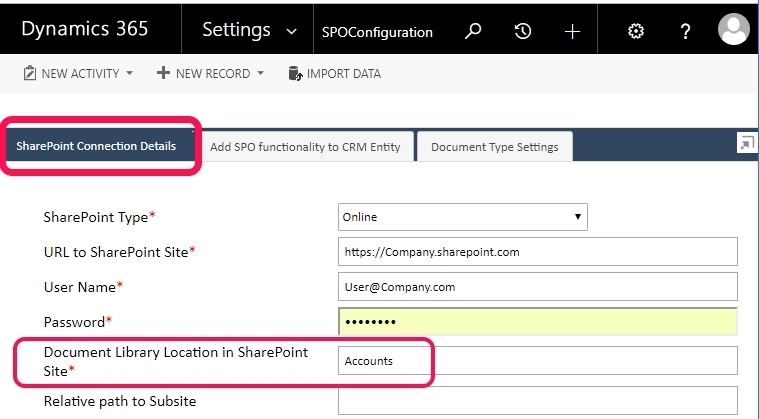 After creating successful connection to the Document Library in SharePoint, the next step is adding SPO functionality to the Account entity. Click tab: Add SPO functionality to CRM Entity, and then click the button with same label. Add metadata from CRM entity view: select existing view or create custom view that includes all the fields in the Account entity and related entities to Account, to be used as metadata. In this example we created a view called “SPO View”, and it includes the metadata relevant to documents uploaded from Account entity to SharePoint, including one field (Contact’s Email) from the Contact entity which is related to the Account entity. Select the “Required” option next to the metadata field that is mandatory in SharePoint. At initial settings stage, and testing, do not use the “Required” option (unselect all). Select step 4 to store documents in folders within the “Accounts” document library. The folder name is a selected field from the account entity like “Account Name” or “Account number”. We recommend selecting a field that is unique and always contains data. Click Submit to complete this process. Modify the view to show relevant columns only. Set up filters, sorting and other available features to make it a “friendly” view for SharePoint users. Open an Account record in CRM. From the toolbar (in more …. functions) click the button Dynamics SPO and select to upload document from hard disk. Select document and upload. The document is now uploaded to a folder in the Accounts document library. The folder name is the content of the field selected as folder name (in this example it is Account Name), and it is saved with metadata from the CRM record. NOTE: each time document is uploaded to SharePoint a new SPO Error is created. Use Advance Find to find the last created record, in case you wish debugging failed document upload. Open the Account’s form editor.